The Jazzman/Now-Again Funk series has offered surveys as broad as they are deep: Midwest Funk, Texas Funk, Florida Funk, Carolina Funk. 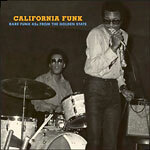 Yet this might be the most important trawl of all: California Funk. Over a decade in the making, this, from compilers Malcolm Catto and Gerald ''Jazzman'' Short, is the Funk masterpiece. This anthology examines what happened to the independent ensembles who gigged during Sly and the Family Stone's Bay-area renaissance. It delves into the stories sidemen who worked alongside LA's Charles Wright and the Watt's 103rd Street Rhythm Bands and offers answers to elusive questions. At the same time, it offers thunderous drums, fuzzy wah-wah, fat basslines, blistering horns and exhortations akin to James Brown and his many disciples over its 21 track selection. This official reissue was licensed by the lost bandleaders, bass players, drummers, label owners and studio-vets, independents, all, lost to history no more. Packaged as a ''mini-LP'' in a thick, ''paste-on'' gatefold cardboard sleeve Now-Again's issue of California Funk also comes with a 24-page full color booklet with full liner notes, annotation, and never-before-seen photos of these most impressive organizations.